Family Programs Hawaii works with community partners to bring siblings separated by the foster care system together for visitations in our Project Visitation program. The Locations Foundation has been a big supporter of helping our keiki maintain siblings bonds by hosting events for them to gather, have fun, be a family again if only for that day of the month. The Locations Foundation sponsors many nonprofits in our community and during the month of September, they are doing random acts of kindness, visiting a different nonprofit everyday for 30 days to show their love and support for the selfless work that happens in our community. 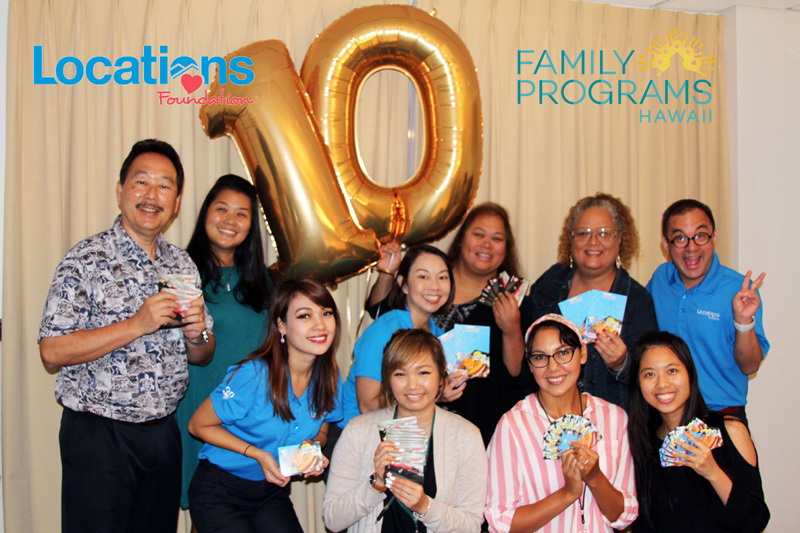 Family Programs Hawaii was selected for the 10th day of giving, receiving $1,000 worth of Zippy’s and gas gift cards to the Project Visitation program. These gift cards are vital to this currently unfunded program as they help volunteers pay for gas and food when bringing siblings together from all over the island. Without these gift cards, our volunteers pay for gas, food, and activities once a month to ensure siblings get to spend time together. If you would like to get involved with Project Visitation by becoming a benefactor, donor, community partner, or volunteer, please contact us. Because of our community partners, we are able to accomplish our mission in strengthening children and families in Hawaii, especially those involved with the foster care system. To learn more about the Locations Foundation’s random acts of kindness, please visit https://www.locationshawaii.com/news/locations-foundation/locations-foundation-wraps-up-first-week-of-random-acts-of-kindness/. Pictured above: President and CEO Keith Kuboyama (far left) poses with Family Programs Hawaii staff and two representatives from the Locations foundations including Wade Uehara (far right, top) to receive gift cards from the Locations Foundation.